Domaine de la Noguiere luxury camping site is tucked inside a fortress of palatial pine forest land. Set against a rocky terrain typical of this stretch of the French Riviera, it offers a multitude of outdoor physical activities for families who like to be on the move. For further information on how to book your bungalow tent or mobile home at the foot of mighty mountains, contact LuxCamp today. Welcome to Domaine de la Noguiere Campsite. 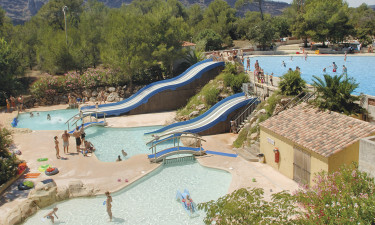 About Domaine de la Noguiere Campsite. Domaine de la Noguiere luxury camping has access to a variety of outdoor and indoor sports and activities. There's an onsite family pool with a smaller pond for the little ones to enjoy. Take your pick of the two multi-slide features, or watch the kids have fun in the two playground areas. You can also play tennis, table tennis, football or boules. The local lake houses carp, meaning you can try your hand at some fresh water fishing. With all that activity, remember to take some time out and top up your tan on the sun loungers on the terraces. 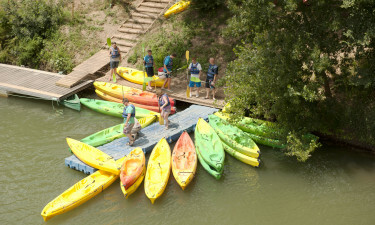 There are three rivers that flow through the neighbouring town of Le Muy; perfect for picnics on the banks, or why not hire a canoe or kayak and float down stream? Hiking and cycling enthusiasts have access to a hubbub of outdoor activities. Le Masssif de l’esterel has lots of walking trails and you can climb the 618 metres to the top of Mont Vinaigre. The surrounding beauty hotspots of Esteral, the Maures and the valley of Argens are gorgeous places to go horse riding. Roquebrune is a firm family favourite destination that attracts tourists from all over the globe. Typical of French tradition and heritage, it has a 16th century watch tower as a centrepiece. Have a wander through its charming, winding lane ways and avenues. It's only 8 km from the site grounds, and makes a lovely day out. Sample some of that gorgeous French cuisine, or sip on a glass of chilled wine while you soak up the setting sun. You can also stock up on your camping essentials there. While not relaxing in your luxury bungalow or mobile home, the site puts on regular evening entertainment. 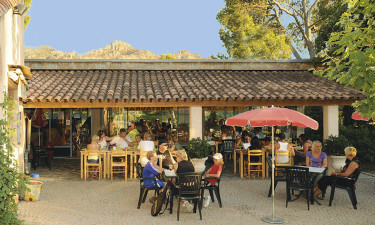 You don't have far to go to experience some traditional French dishes as there's a restaurant and take-away onsite too. Afterwards, you can sip on a cold beer at the lively bar. Domaine de la Noguiere campsite has a small grocery store where you'll find regular items like bread, pastries, coffee, fruit and vegetables. The surrounding towns also provide ample opportunities to go shopping and stock up on other essential camping necessities, not to mention some great retail therapy.